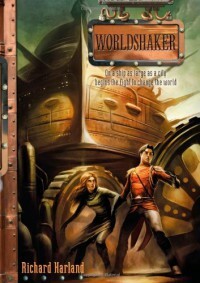 Worldshaker is strikingly similar in premise to Mortal Engines, and, like Mortal Engines, disappointed despite my love of both dystopias and steampunk. In this case, the writing is perfectly fine and both Colbert’s stepwise enlightenment and the actions of his sister provided enough interest to keep me reading, but not enough to counteract the overall lack of distinction and two frustrating strange choices.Strange Choice Number One:Every single person involved in Colbert’s upper-class, best-available education is completely inane. The people of the Worldshaker have lost awareness and knowledge of their history and they are obsessed with their superiority over the filthies and with cleanliness of mind and body—these are important points to convey for worldbuilding and to forward the plot, but it does not require the education of the ruling classes—through schools and tutors—to be utterly nonsensical and pointless. In fact, it would be much scarier and more believable if the teachers were intelligent and their arguments basically logical; then we could see this as a plausible world, a frightening possibility that maintains itself through manipulation and propaganda. Instead, it’s just inane.Strange Choice Number Two:The filthies have one major strategic advantage over the upper decks, and they don’t use it.Spoilers abound for the rest of this sectionThe Filthies’ stated purpose on the ship is to keep the boilers going and, by implication, keep the big engines and machines running. That’s why they’re still fed and a sufficient population kept alive. (A small percentage of Filthies are modified into Menials, speechless servants with their brains surgically limited who work on the upper decks). That means they have control over the boilers and the big machines. They could hold the movement, and thus the survival, of the Worldshaker hostage. They could threaten to destroy the engines and strand the ship forever. They could stop the ship and take advantage of everyone freaking out to attack the upper decks. They do none of these things. It’s not even acknowledged that they have this advantage! And then one of the upper decks people threatens to destroy the ship by overheating the boilers and making them explode, and no one, including the leaders of the Filthies, thinks to have them stop stoking the boilers, or dampen them, or open release valve, or a number of other things they could presumably do. Their entire reason for existence is just forgotten.Enough spoilers! No more belowIn general, it’s an okay book with a few interesting characters, but it’s nothing special.